A reader by the name of Allie Valtakis successfully identified the fossil last week as worm burrows and another reader further identified them as Serpulid tubeworms. Great job! Here is the picture again for those who did not see it. The picture comes from Donald Hattin’s “Stratigraphy of the Carlile Shale (Upper Cretaceous) in Kansas: Kansas Geological Survey, Bulletin 156, 1962. Plate 13. It is listed as Serpula semicoalita Whiteaves, encrusted upon fragment of Inoceramus cuvieri, middle part of Fairport (Loc. 37), x1/2, hypotypes, KU1202062J1. In 1984, Norman Sohl and Carl Koch reported finding an unidentified Serpula species in Hempstead County, near Hope, in the Arkadelphia Marl, a Cretaceous limey mud well known for its shallow marine fossils. Numerous Exogyra oysters and Gryphaea have been pulled from the mud there, along with a variety of other fossils. On this particular occasion, they found, lithophagid borings, pycnodontes, Exogyra costata, Gryphaeostrea, Crassatella, Anchura, Discoscaphites, Clione, and last, but not least, Serpula. Sadly, they provided only a faunal list and not a single picture in the entire report. They provide a map on page three of the localities, but that is it. How one writes a report 282 pages long, consisting of one illustration, two tables, and 270 pages of lists of fossils without a single illustration of anything collected is truly a mystery to me. At any rate, here is the citation, the actual report is at the link provided above. Sohl, N. F., and Koch, C. F., 1984, Upper Cretaceous (Maestrichtian) larger invertebrate fossils from the Haustator bilira Assemblage Zone in the West Gulf Coastal Plain: Open-File Report. So what are serpulids anyway? They are annelids, meaning they are segmented worms, just like earthworms. But unlike earthworms, these are polychaetes, or bristle worms, so a lot of them look like pipe cleaners. Serpulids in particular are marine and sessile, meaning they like to stay in one place and attack themselves to a surface. 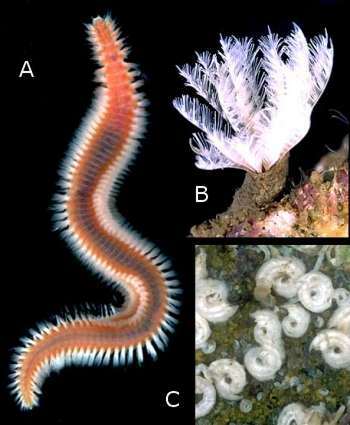 They are rather unusual for worms in that they are important biomineralizers. They make long calcium carbonate tubes in which they can pull themselves into when threatened. Unlike other tubeworms, serpulids even have a lid, called an operculum, they can close the tube with. While they are common in shallow marine settings, the pictures most people have seen of them have come from nature documentaries showing the ones that live near hydrothermal vents because they have an unusually wide range of thermal and pressure tolerances, with species living throughout the oceans. Serpulids don’t get nearly as big, with the largest modern ones rarely getting more than about 150 mm in length and 5 mm wide, although they cause more problems, seeing as they live in shallower water and like to attach themselves to boats. They will also attach themselves to clams, coral, rocks, and pretty much any other surface they can find. The fossil record of serpulids goes back to the middle Triassic, but the only record of them in Arkansas is the one from the Cretaceous. There are reports of possible annelid tracks in the Ordovician rocks of the Ouachitas, but that would be too early for serpulids and without any fossils to back them up, the tracks could well be anything. Polychaetes make for terrible fossil makers, as they are mostly soft tissue and fall apart into mostly unrecognizable chitin pieces quickly after death, making serpulids unusual for the group. The tubes they make give them a far better chance at making it through the fossilization process, so they show up disproportionately in the fossil record compared to their kin. 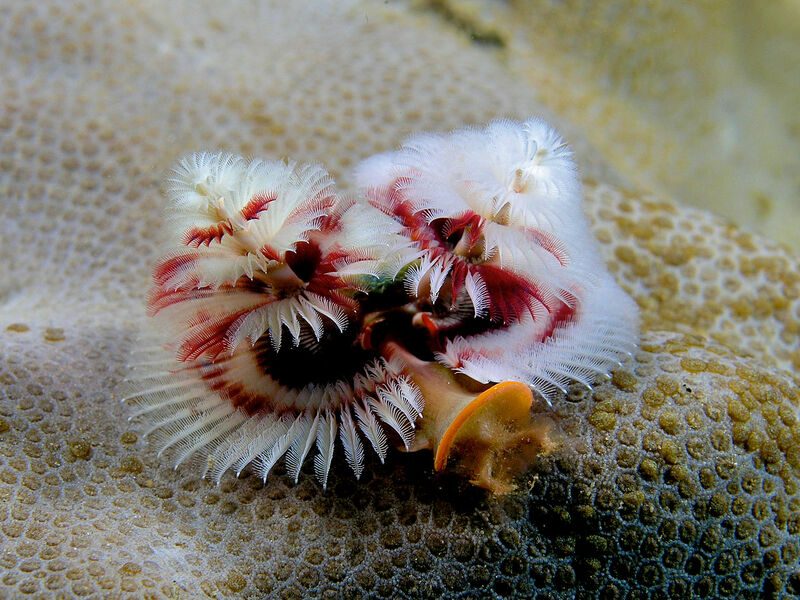 Tubeworms like this are filter feeders, but some other polychaetes are carnivores, which is all that Hollywood has needed to turn deep sea tubeworms into this. Gotta love B-grade monster movies. It seems that I will not be able to consistently get the explanatory posts out as timely as I would like for the mystery fossils. So what I think I am going to do in the future is to continue to put them on Facebook as mystery fossils, but I will skip the initial post here. So if you want to follow the attempts to recognize the fossils before I post them on the blog, follow the Facebook feed and get a jump on the blog posts. Speaking of the Facebook page, I have found the the later Google Chrome updates have somehow broken the Facebook link on the website, so the Facebook posts are no longer showing up on the page as they are supposed to. They work correctly on Internet Explorer, so I do not know why they aren’t working on Google Chrome. I am not a computer programmer, but I will see what I can do about that, although that may just have to wait until the revamp of the site, which I am planning. In the meantime, I appreciate your patience and thanks for reading. Here is a new fossil for you to identify. I haven’t put up anything like it before, so you can rule out any of the usual candidates. I will put up the answer next Monday unless some early bird beats me to it. Good luck.